Solvent Zero Technologies is revolutionizing the industry by creating a new and dynamic approach to rosin extraction. 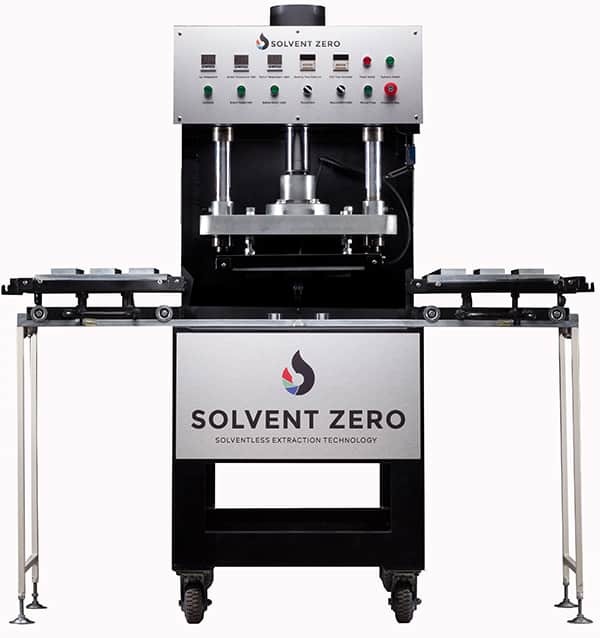 Solvent Zero is the leader in the latest solvent-free patent-pending rosin extraction technology and manufactures the largest commercial sized rosin press machine in the world. Solvent Zero’s patent-pending technology is designed for maximum yield and quality. Our machines are compact, user-friendly and extremely durable. Solvent Zero is a non-volatile extraction method, using absolutely NO chemicals or solvents. Using only scientifically precise heat and pressure, our machines are capable of processing commercial amounts of plant material in a fraction of the time and cost of any other machines currently on the market. Extraction can now be done quickly and easily with the push of a button. Solvent Zero technologies provides a solution that is without a doubt the easiest to use and most effective extraction technology on the market today. Our machines are friendly to both the environment and the user, producing a pure finished product with a full terpene profile in minutes. The applications for solventless rosin are endless (tinctures, topicals, vapes, oils, etc), and are just now being fully realized in the market.